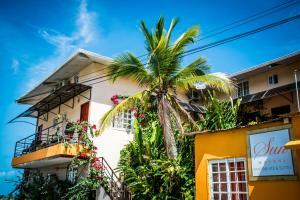 ﻿ Best Price on Chalet Tio Juan in Bocas del Toro + Reviews! Chalet Tio Juan is a charming four bedroom Chalet. Located in the heart of a small neighborhood called Saigon, just a ten minutes’ walk away from Bocas Town or a $1 taxi ride. Chalet Tio Juan is hidden behind a tropical garden. 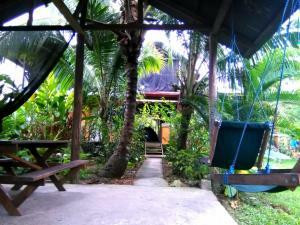 The front porch has a dining area, hammocks and place to hang out and relax. Chalet Tio Juan is a four bedroom house that sleeps up to 9 people. The kitchen and the bathroom are shared by all. There are three double rooms and one triple room. All rooms have semi orthopedic mattresses, Cable TV, Wi-Fi, strong ceiling vans, safety box and sink. The kitchen is small but complete and two can cook at the same time, with two stoves and two sinks. Kitchenware is provided. This property is 1.6 mi from Tortuga Beach and 5.9 mi from Bluff Beach.